Cape Town is a unique city in terms of biodiversity. It is located in a biodiversity hotspot, at the core of Cape Floristic Region, a floral kingdom. At the center of this floral kingdom is a unique plant family: Fynbos. Fynbos grows in a 100-to-200-km-wide coastal belt stretching from Clanwilliam on the West coast to Port Elizabeth on the Southeast coast. Fynbos accounts for half of the surface area and 80% of the plant species of the Cape Floristic Region. The fynbos in the western regions is richer and more varied than in the eastern regions of South Africa. Of the world's six floral kingdoms, the Cape Floristic Region is the smallest and richest per unit of area. The Holarctic kingdom, in contrast, incorporates the whole of the Northern Hemisphere north of the tropics. The diversity of fynbos plants is extremely high, with over 9000 species of plants occurring in the area, around 6200 of which are endemic, i.e. growing nowhere else in the world. South Africa's Western Cape has a level of botanic diversity that exceeds that of the richest tropical rainforest in South America, including the Amazon. Cape Town sits in the south-westernmost tip of the Cape Floristic Region, within one of the most biodiverse spots within the Kingdom. However, despite this prominent position urban processes within the city have continuously threatened the environment. A lot of the original vegetation has been lost. 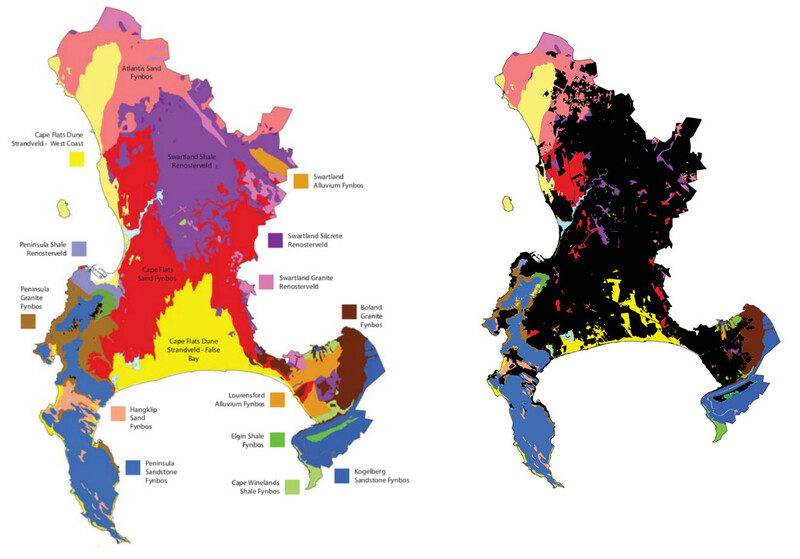 The map below shows the various vegetation types that exist within the city boundaries (left hand side) as well as the transformed landscape (right hand side). The important but threatened biodiversity of Cape Town is what has motivated us to initiate Communitree in this city. There is a lot to be gained from trying to protect the remaining patches of original vegetation but as can be seen from the maps we will also need to try and restore some of the indigenous vegetation and create links between remaining patches. This is exactly what we are trying to achieve!